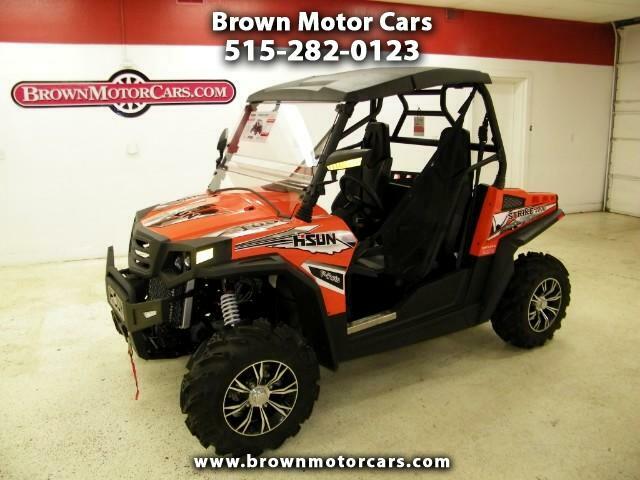 Stop out and take a look at this brand new 2015 Hisun Strike 1000 Sport UTV! These come standard with many options that are upgrades on most other models! This Strike 1000 comes standard with a 3,500lb winch, power steering, 18 way adjustable shocks, windshield, roof, turn signals, running lights, horn, locking rear differential, fuel injected v-twin engine, aluminum wheels, and tons more! Why pay tons extra for additional options when these come standard with them? All of our Hisun UTV's are backed with a One year warranty! Stop out and take a look at our entire inventory of sport and utility UTV's today!